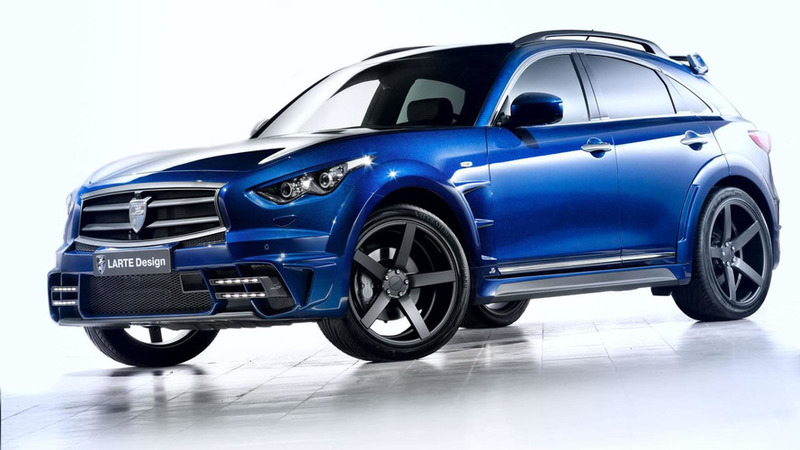 LARTE Design has dressed the Infiniti QX70 in new clothing through a new body kit made from polyurethane through injection molding (PU RIM). Russian tuners from LARTE Design must have a soft spot for Infiniti models as after restyling the QX60 and QX80 they now took care of the QX70 crossover. The Moscow-based aftermarket specialists created a PU RIM body kit with a reshaped front apron and a completely new grille with matte-black coarse struts. We also notice the dual-bar LED daytime running lights flanking the large mesh lower grille and sitting next to the larger vents. The upper grille is also new and has received matte black coarse struts. Moving at the back there's a redesigned rear spoiler, a new apron and solid side trims on the flanks. It also comes with vents behind the wheel arches along with broader wings which have increased the car's width by five centimeters. The Infiniti QX70 now rides on 22-inch alloy wheels featuring an angular configuration and a matte black look. Rounding off the list of changes is a quad exhaust system with 101mm black chrome tailpipes manufactured from stainless steel.